In my youth, I always had a motorcycle. I lived in the bush and that was how we got around. When I was 12 years old my father got me a giant, ugly moped and that was my first bike. I then worked my way through a couple little two-stroke dirt bikes before moving to the street and ending with a crotch rocket that I finally sold to help with college tuition. So, almost twenty years later, when my wife expressed interest in riding motorcycles, I decided that 2010 would be the year to restart an old pastime. Although we both plan to use these as daily drivers in summer, the main idea is trail riding. Luckily dual sport bikes are much more common these days and we have many to choose from. Originally, I had my eye on a BMW F800GS. I was *that close* to ordering one of the yellow 2009s. The only problem is service. The nearest BMW dealer is more than 700km away! That three year warranty does me no good when I have to ride two full days for an oil change! With a little research, I discovered there is a KTM dealer less than 45 minutes away! (George's Garage in Matheson, Ontario) So in late Fall of 2009, I gave them a call so see if they had a 990 Adventure in stock that I could have a look at. They did not but the owner, Mr. Gilles Laderoute, told me he would be willing to sell me his 2004 950. Normally, I would have outright passed on used equipment but as he explained it to me, this bike was owned by the rep for KTM Canada and used as a demo for trade shows and rallies, etc. So I figured: "what the hell, can't hurt to look" and drove down to see it. Turned out the bike is literally in mint condition. It had two small scuff marks low on one of the tanks but other than that it is pristine. In my usual think-things-through-before-making-a-decision manner I cut him a cheque on the spot and walked away as the owner of a 2004 KTM 950 Adventure. So now I have this beautiful, big motorcycle sitting in my bay demanding attention! Well, jeez - I guess I could modify it? With only two wheels, this machine is bound fall over at some point and at 500 pounds you can bet it will land pretty hard. So first up was to add a crash bar. This picture was taken in the first snowstorm of the season. 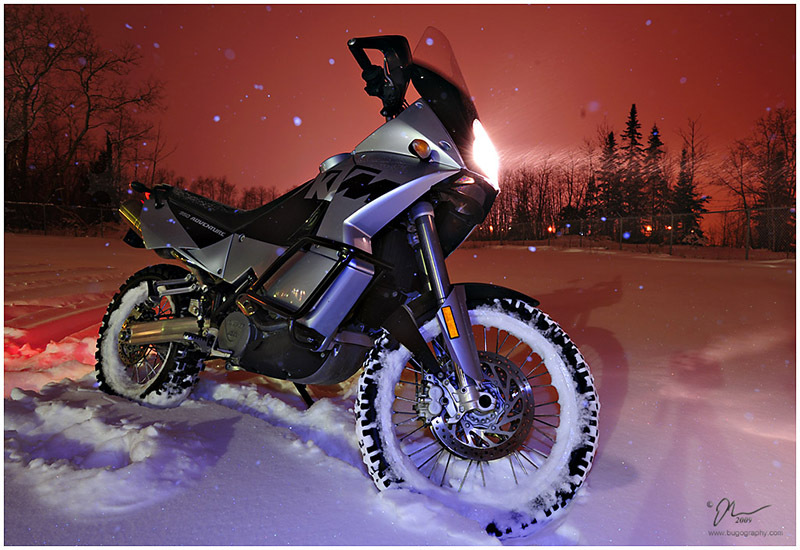 I thought the blowing snow would make a cool contrast to a motorcycle and rode it out into the back lot at my shop. It proved to certainly not be one of my brighter ideas, as this big fellow does not handle well in snow and will dig a trench (i.e. you're stuck) in a heartbeat. But, I got the photo without having to test the crash bars and it came out pretty cool.